Be it Continental,. Chinese, Oriental, Indian or Tandoor fare, "Appetite" has it all for everyone in the family. 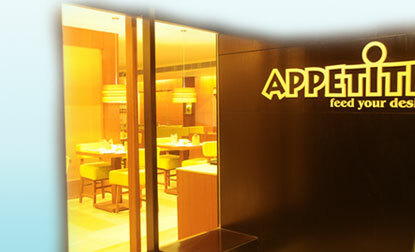 Mouth-watering delicacies and personalised service makes it a fabulous dining experince for all occasions. Spread in 2500 sq. ft. it is well equipped with 120 seats amidst background os steel grant and tastefully decorated and mind-blowing ambience, it offers a wide range of food from around the world, and a large collection of mocktails to choose from. The resturant perfectly complements the contemporary ambiance, making it the perfect place to relax and unwind with friends or colleagues while enjoying your favourite cuisine along with a drink. The exclusive serene environment immediately helps you to forget the hustle and bustle of everyday life. Pamper yourself today! !